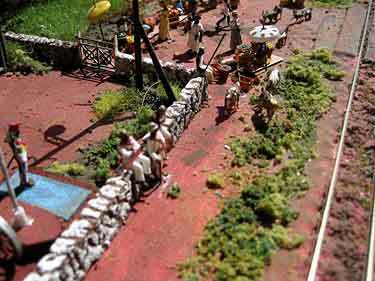 The classic small-or-micro layout is a straight board around one foot (30cm) deep and 4 to 6 feet (120 to 180 cm) long. 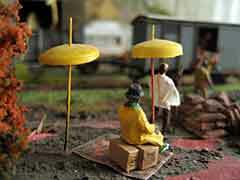 Here’s a collection of interesting examples in HO or smaller scales. This is Part 1… watch for Part 2 soon! 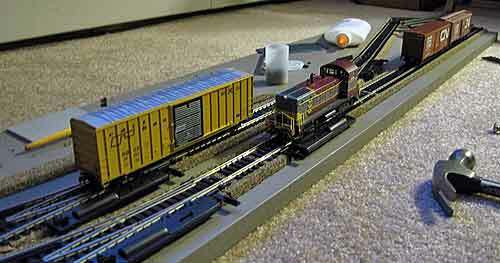 “This layout, built in ¼in scale on Peco O-16.5 Track, is aimed at the Younger Generation. All that is required to operate it is a push on the RED Button. It depicts the American Noise-R-Us Fireworks factory situated at a town called Fawkesville in the American Midwest. “In view of the inherent danger when manufacturing fireworks the City Fathers of Fawkesville insisted on the factory being built some miles from the town in a semi-desert area. However they did agree to Noise-R-Us building a tramway (trolley line) from Fawkesville out to the factory. This enabled the workforce to easily reach their place of work. You will see the tram leave its shed and proceed to the factory station and then head out to Fawkesville before returning with some workers ready for the next shift. “A chip controls both the sequence and the turnout motor; the surprise for kids is that part way through the sequence the Bachmann autoreversing tram goes back into shed and immediately comes out again. 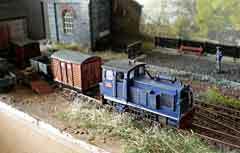 The layout has proved immensely popular and not just with its intended audience! In the works currently is an LED starburst fireworks display that will climb the black backdrop and shower the scene with sparks. 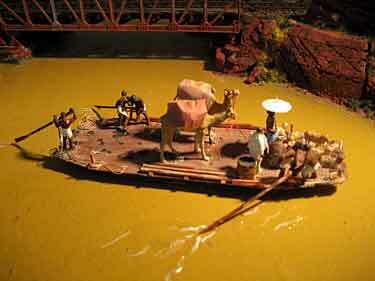 The above photos were all taken with extra lighting in order to show the layout’s construction and features. 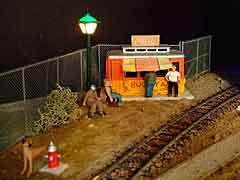 Gerry also made a short video of the scene operating in the dark, as it does at shows. 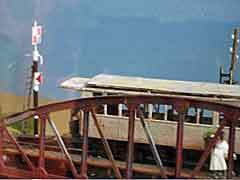 For more photos of Guy’s Fizz-Bang Tram, see Gerry’swebsite. To see the video, just click on the triangle below. U.S. SHORTLINE FROM DANISH WEBSITE WITH U.K. DESIGN WAS BUILT IN CHINA! 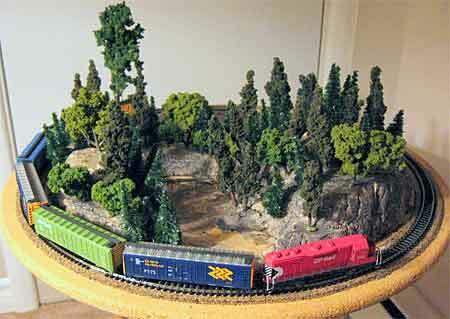 He shipped himself a carton of N scale model railroad supplies, and began thinking about a layout in China. He had internet access there, and while studying this site became intrigued by Giles Barnabe’s Micro Portage Layout in Scrapbook#44. He built an L-shaped version of the layout, measuring 133x105cm (52x41in). At that point he happened upon Carl Lundsten’s railfanningwebsite, which describes the Turtle Creek Industrial Railroad, an 11-mile shortline in Pittsburgh not far from David’s hometown (and not far from this site’s editor’s home). And he noticed that, with only a few changes, his layout could be operated very much like this little line! 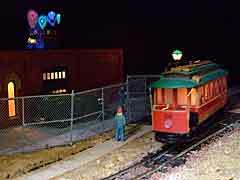 The result was the Turtle Creek Industrial RR, shown in the photos as constructed in China. 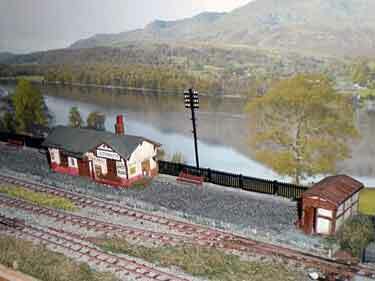 David describes it, “The plan had the interchange with Conrail (now NS) in Trafford at the far left, with a spur for a fictional team track and oil dealer. 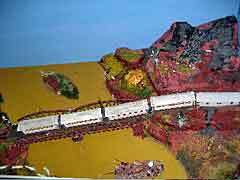 Moving right (north), the line passed under the Pennsylvania Turnpike, then over Turtle Creek on a scratchbuilt (plastic) concrete bridge complete with a PRR keystone. Then the line turned east, entered Murrysville with service to a lumber dealer, passed the line to the old Export coal mine, and continued to Export and the Durabond steel plant there. 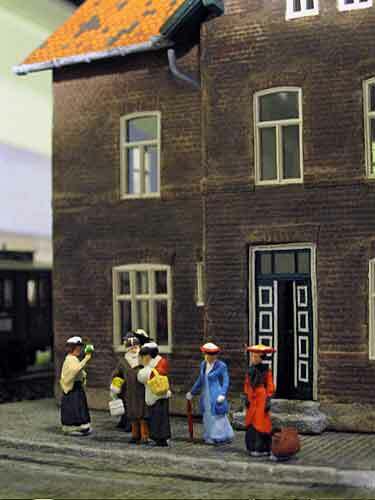 Marienbad is a modular, wall-mounted HO layout under construction by Sven van der Hart, from Utrecht in The Netherlands. Each module measures 60x35cm (24x15in), so the total layout is 3m (almost 10ft) long. This is Sven’s first attempt at scratchbuilding scenery and structures, and he’s finding it very enjoyable: “I’ve been building now for a year, and I notice that I’m still very motivated to work on it.” There’s more layout information on his website. Alan’s version, called Llanast (Welsh for “a mess”), follows the Heath plan closely. 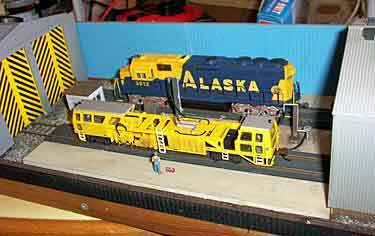 Alan built it using Peco Set Track sections straight from the scrap box. The layout is currently at the “shining up” stage of adding bits and pieces, improving on areas that he can now do better, and the like. The plan itself allows considerable movement of both passengers and freight. Mainlände Stadtbahnhof is an HO layout project of Alexander Kaczmarek, from Berlin, Germany. Mainlände is a small, picturesque town with medieval walls and exposed-beam houses, on the banks of the River Main. The main railway line and station (Mainlände Bahnhof) are about 5 km away, so the Deutsche Bundesbahn (DB) built a branch line to the town and uses a short Schienenbusse (railbus) to carry passengers out to the main line trains. The layout measures 165x35cm (65x14in). 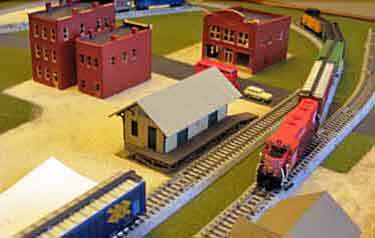 Traffic is organized in a two-track fiddle yard under the elevated street and buildings. We’ll try to keep you posted as construction gets under way. Gotha is a town roughly in the center of Ethiopia, on the Gotha Shet (“Gotha River” in Ethiopian). 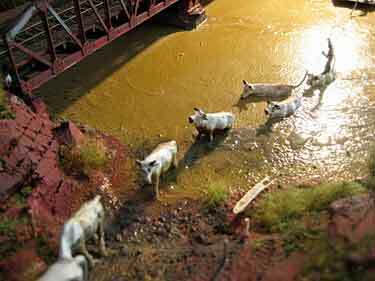 In this HOm model (1:87 scale on 12mm track) Gotha is a station on the CFFE (Chemin de Fer Franco-Ethiopien), the rail line between the capital of Addis Ababa and Djibouti on the Red Sea. The time is 1923, in the days of the Empress Zawditu. 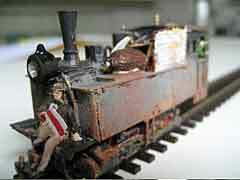 The model was built by Rainer Spohr(top left), from Kassel, Germany, and is an exotic railway to say the least! Gotha Upon Gotha Shet is built on three modules, each 100x50cm (39x20in). 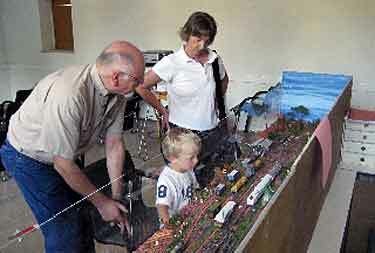 With a fiddle yard attached at each end, the passing scene features trains stopping to take on water and wood (the steam engines all burn wood), freight trains are overtaken by passenger trains, and other trains conduct meets at the station. The hand drawn plan at the right shows the suppposed track arrangement at Gotha in 1923. The aerial photo beneath it showing the left-hand module will help you understand the arrangement. 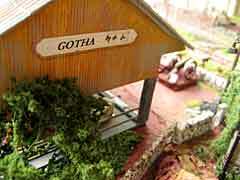 Gotha won third prize in a national model railway competition held two years ago by Eisenbahn Kurier magazine. 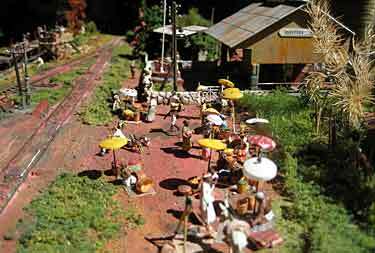 Dave Carson, from Stowmarket, Suffolk, England, spent some of his recuperation after surgery in building this 36x7in (90x18cm) “working diorama,” Fuel Pad. Two double-tracked sheds share a fueling point between them. 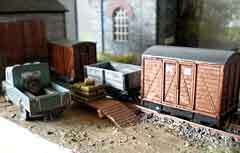 Only one is used for stabling, however; the other shed hides the controller. Operation, though limited, affords an excellent opportunity to show off prized rolling stock in realistic surroundings. 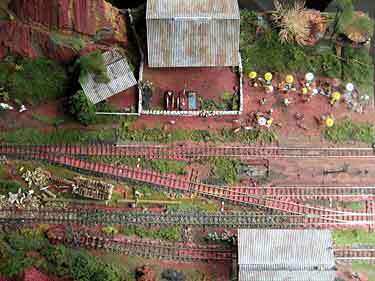 Frequent contributor MJ Idzerda, from London, Ontario, Canada, is coming to grips with the problem of deciding on a layout plan and actually starting construction. 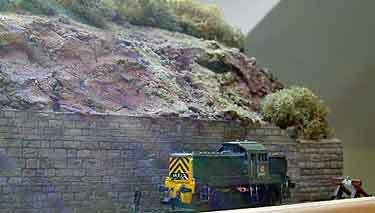 He’s decided on a 6x1ft (180x30cm) HO shelf railroad (the kind he had as a boy), and wants if possible to build a direct copy of South Central Street near Alameda in Los Angeles—the Davies Warehouse Co. in the downtown Espee Rat Hole switching district, featured by Bob Smaus in Model Railroader magazine. Above and at right are MJ’s full-sized mockups of a reasonable facsimile of this scene that will fit on a shelf. The tracks have a seductive “S” curve and form a natural-looking Inglenook switching pattern. Looks good! But wait! As happens to so many of us, another thought struck MJ as he was preparing to put saw to wood… and the result was another classic switching pattern… a Tymesaver (below). What did he do? Read on! The cork arrived, MJ laid the track, and the results are shown at left. Next steps: operations and scenery! We’ll keep you posted. The board measures 48x8in (120x20cm) and is recycled from a previous layout. 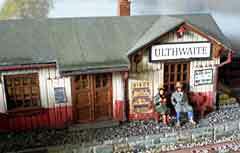 The rail line is OO9 (1:76 scale on 9mm gauge). Take a good look at the way Martin uses the photographic backscene… we seem to look down at the lake from a slightly elevated position (very common viewing angle in the Lake District), and the realism is almost uncanny (photo at bottom right shows this effect even more strongly). For more photos and information, see Martin’s blog. 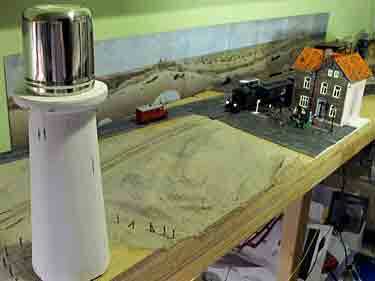 ANOTHER TRACKMOBILE LAYOUT… INGENIOUS USE OF A CD TURNTABLE! “The disc at the right is a CD (hidden inside/behind the building), used as a turntable to turn the Trackmobile, allowing it to link to both ends of cars without modification. One side is hidden inside the building (Pikestuff or similar) and the other appears to run behind it. 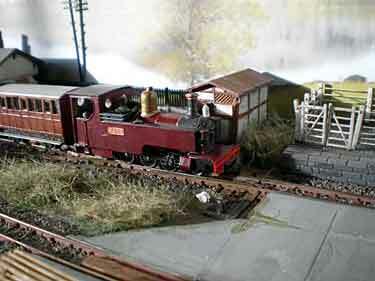 Use of a double length Peco Loco Lift at left end as fiddle yard (see sketch) extends tracks and allows stock changes. The track top left could use the same system (or possibly just a standard single one) to allow stock to go ‘deeper’ into the plant.” Double-length Loco Lift is described inScrapbook #80. 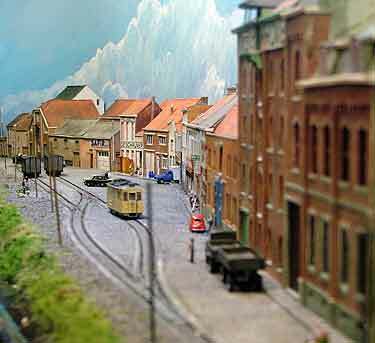 “Here are a few pictures of Ninove, the Nm scale (1:160 on 6.5mm gauge) entry which got me a third place. 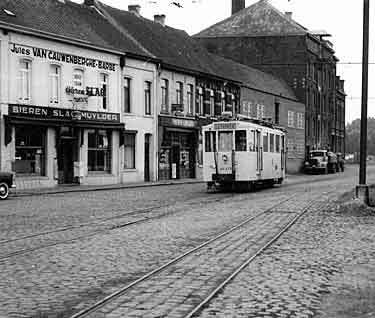 It depicts the endstation of the Belgian SNCV-tramlines Brussels-Ninove and Leerbeek-Ninove in 50s and 60s of the last century. All the buildings are copies of the originals. They are constructed in cardboard. 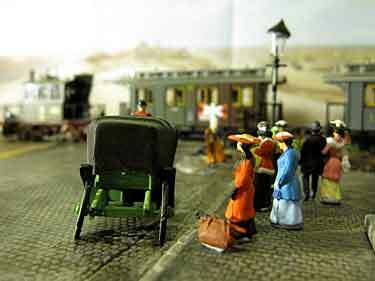 The trams and wagons are also handmade from a lot of Märklin and Micro-trains Z scale pieces. I also include an old picture which shows the situation in the 1960s.